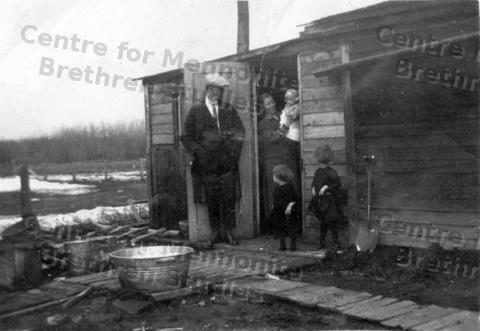 This is a photo of the shack by the railway line in Laird, Saskatchewan, which Jacob and Anna Funk bought for their family. That’s me (Katie Funk Wiebe) in Anna’s arms. I was also born in this shack. My two older sisters, Elfrieda and Anne, are also pictured. It is spring 1925.